Azure Event Hubs enables you to automatically capture the streaming data in Event Hubs in an Azure Blob storage or Azure Data Lake Storage account of your choice, with the added flexibility of specifying a time or size interval. Setting up Capture is fast, there are no administrative costs to run it, and it scales automatically with Event Hubs throughput units. Event Hubs Capture is the easiest way to load streaming data into Azure, and enables you to focus on data processing rather than on data capture. Event Hubs Capture enables you to process real-time and batch-based pipelines on the same stream. This means you can build solutions that grow with your needs over time. Whether you're building batch-based systems today with an eye towards future real-time processing, or you want to add an efficient cold path to an existing real-time solution, Event Hubs Capture makes working with streaming data easier. Currently, the Event Hubs Capture feature supports only Gen 1 of Azure Data Lake Store, not Gen 2. Event Hubs is a time-retention durable buffer for telemetry ingress, similar to a distributed log. The key to scaling in Event Hubs is the partitioned consumer model. Each partition is an independent segment of data and is consumed independently. Over time this data ages off, based on the configurable retention period. As a result, a given event hub never gets "too full." Event Hubs Capture enables you to specify your own Azure Blob storage account and container, or Azure Data Lake Store account, which are used to store the captured data. These accounts can be in the same region as your event hub or in another region, adding to the flexibility of the Event Hubs Capture feature. 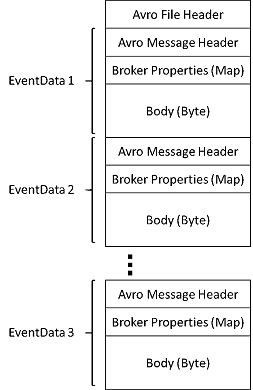 Captured data is written in Apache Avro format: a compact, fast, binary format that provides rich data structures with inline schema. This format is widely used in the Hadoop ecosystem, Stream Analytics, and Azure Data Factory. More information about working with Avro is available later in this article. Event Hubs traffic is controlled by throughput units. A single throughput unit allows 1 MB per second or 1000 events per second of ingress and twice that amount of egress. Standard Event Hubs can be configured with 1-20 throughput units, and you can purchase more with a quota increase support request. Usage beyond your purchased throughput units is throttled. Event Hubs Capture copies data directly from the internal Event Hubs storage, bypassing throughput unit egress quotas and saving your egress for other processing readers, such as Stream Analytics or Spark. Once configured, Event Hubs Capture runs automatically when you send your first event, and continues running. To make it easier for your downstream processing to know that the process is working, Event Hubs writes empty files when there is no data. This process provides a predictable cadence and marker that can feed your batch processors. Event Hubs Capture creates files in Avro format, as specified on the configured time window. You can view these files in any tool such as Azure Storage Explorer. You can download the files locally to work on them. An easy way to explore Avro files is by using the Avro Tools jar from Apache. You can also use Apache Drill for a lightweight SQL-driven experience or Apache Spark to perform complex distributed processing on the ingested data. Apache Drill is an "open-source SQL query engine for Big Data exploration" that can query structured and semi-structured data wherever it is. The engine can run as a standalone node or as a huge cluster for great performance. You can also use Avro Tools to convert the file to JSON format and perform other processing. To perform more advanced processing, download and install Avro for your choice of platform. At the time of this writing, there are implementations available for C, C++, C#, Java, NodeJS, Perl, PHP, Python, and Ruby. Apache Avro has complete Getting Started guides for Java and Python. You can also read the Getting started with Event Hubs Capture article. Event Hubs Capture is metered similarly to throughput units: as an hourly charge. The charge is directly proportional to the number of throughput units purchased for the namespace. As throughput units are increased and decreased, Event Hubs Capture meters increase and decrease to provide matching performance. The meters occur in tandem. For pricing details, see Event Hubs pricing. You can create an Azure Event Grid subscription with an Event Hubs namespace as its source. The following tutorial shows you how to create an Event Grid subscription with an event hub as a source and an Azure Functions app as a sink: Process and migrate captured Event Hubs data to a SQL Data Warehouse using Event Grid and Azure Functions. Event Hubs Capture is the easiest way to get data into Azure. Using Azure Data Lake, Azure Data Factory, and Azure HDInsight, you can perform batch processing and other analytics using familiar tools and platforms of your choosing, at any scale you need.